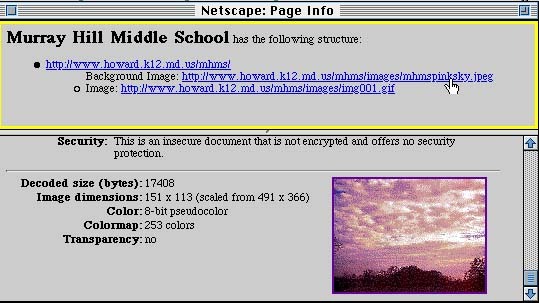 First of all I gotta say that there's a really good tutorial buried deep on Netscape's main site but it's sorta hard to find if you don't have the link. But, if you don't have it, hey... why not use mine? I frequently quote from it, plus I utilize a lot of the graphics that they use... (with full credit, of course!) Besides, you're already here, aren't you? Now, this tutorial is geared towards Netscape Composer 4.7 and higher, but that might change 'cause it seems like Netscape is coming out with new versions of Communicator every day..so stay tuned. Bookmarks A-Go-Go - how to save, collect, and organize your "virtual breadcrumbs"
Now that You are in Composer, Let's Compose! Composer Toolbar - using the right tool...actually, its a button! Adding Text to Your Page - it's just like word processing! "Composer helps you create and edit your own web pages and place (or "post") them on the web. Composer looks and acts like a word processing program, and is just as easy to use. Behind the scenes of each page on the web is code called HTML, which stands for Hypertext Markup Language. This name means that HTML is is the computer language used for marking up documents with links in them. The code, called HTML source code, tells the web browser how a page should look and act. You don't need to know how to write HTML code to make a web page. Composer enables you to work in a WYSIWIG (what you see is what you get) environment - just like a word processor - and it automatically generates the HTML code you need to make your page do what you want it to do. 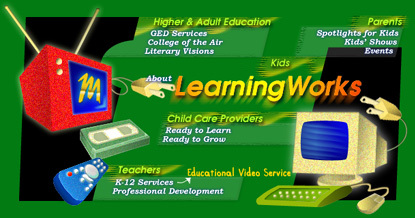 The basic elements of a web page are text, pictures, and links. You can put all of these and more on your own pages, and then publish those pages on the web." 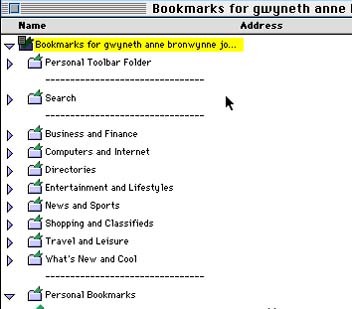 Saving, collecting, and organizing bookmarks within Netscape Communicator is a whole lot of fun....Really! I mean, have you ever found a really *perfect* site only to go elsewhere and not be able to find your way back again? doh! The bookmark is your virtual “bread crumb” to leave behind you so that you can go back again to a great site. Well, here's how to organize and save those bookmarks so that you can always find that perfect site for that perfect lesson! And if you save them to a disk, you can share them with a colleague, take them to a conference, or even create a quick web page! After you save several bookmarks (by going up to Bookmarks and choosing Add Bookmark) of the same topic you probably want to organize them and put them into a folder. Believe me, this is very helpful, easy to use, and it looks great. Click on the folder or bookmark you want the separator to separate, then go up to File on your toolbar and New Separator. This will add a short line between your folders/boomarks which looks really nice and helps when scrolling down between the items. Save as an HTML Doc: Highlight the main folder at the top of the bookmarks page by clicking on it once, then go up to File and Save As. Give the document a name that reflects the contents but make sure it ends with .html. This will save your bookmarks as an HTML document that you can use as a Web Page by itself or as a basis to start using Composer. To view this Bookmark page, Netscape should be open. Go up to File then choose Open then choose Page in Composer, select the bookmark document ending with .html that you saved and click Open. This will open the document as a grey web page with all your bookmarks now as hotlinks, your separators as horizontal rules and organized in groupings according to your folders. Now, this page does not have graphics or a background color/design yet of course, but you could add that later with composer ..oh! you say you want to do that? cool!.. keep reading, then! "Many of the pages you see when you browse the web were made by ordinary people like you. 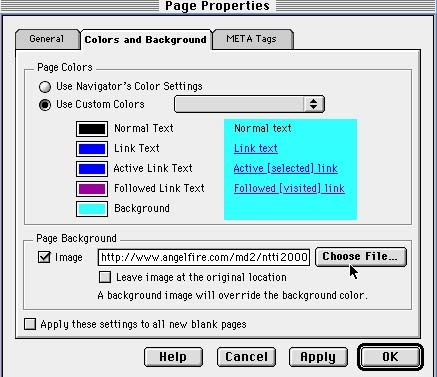 You don't have to be a computer whiz - you can use Netscape Composer, part of Netscape Communicator, to create, edit, and publish your own web pages." "In the Composer window, click to place the insertion point on the page. (You have to start at the top left for now.) Now you can just start typing!" OK, now you are like in Microsoft Word you can change the size, font, colour, alignment and make this page look how you want it to look (this is a definitely an improvement over the Netscape Navigator Gold Editor!) *you* have the last word in Style! Or you could just use the handy tool bar buttons for most of these style choices! don't forget the tool bar, make it your friend! We like short cuts, right? Cool! You can also add horizontal lines to divide the space on your page. OR (easier!) click the Insert Horizontal Line button on the Composition toolbar and voila! Of course, you want to add cool pictures like this, right? Awww, cute kitty! Visit the Easy Web Design Examples page for FREE backgrounds, pictures and animated gifs! "You can put images on your pages to make them more visually interesting. Images are part of why the web is so popular. 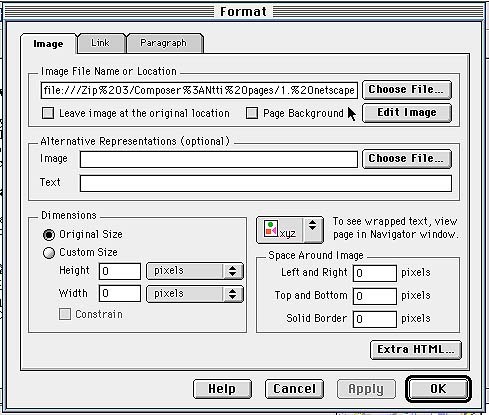 Before the development of browsers like Netscape Navigator that display images "inline," visitors to an Internet site had to download each image separately and open them with a special viewing program. Each image on a web page is a separate file, distinct from the HTML document that makes up a web page. The page contains not the images themselves, but a link to the image, which is displayed as part of the page. While you're making your pages, your images might reside on your hard drive or on the Internet. When you publish your pages on the Internet using Composer, it will post both the pages and the images to the server." Remember, every part of your web page when you are done, including and especially images must be uploaded to the server for your page to work online. Choose Save Image As from the menu. Select the directory/folder you want to save it in, and click Save. find the image saved in your folder on your disk/HD, click Open. Now you have some choices about how that image should look. From this point you can add a solid border (1 or 2 pixels is nice) around the image, or you can custom wrap the text (it will only show up in the View in Navigator window) you can reduce the image by changing the height and width in the custom size window.. all kinds of stuff! When you are done, click Apply and then OK.
Background Images: How to Borrow a Background- with permission of course! If you find a background on a web site that you really like , it is easy to “borrow” it and put it on your page. However, you must get permission to do so first if you plan to publish it online. The easiest way to do this is to Email the web master of the site, explain that you are a teacher and wish to use the background or graphic with a class, and assure that full credit will be given on your page. you must save it first. click the disk button to save. Make sure to save the page in the folder where you had stored all your graphic elements. Now you can preview by clicking View in Navigator. Sometimes, even though you started this page with hotlinks already active (thanks to the old save bookmarks as a .html file trick!) you may want to add more links or make a graphic image a link. "If your page exists only on your local hard drive, you can browse the page, but no one else can. Once you have finished making your web page and have tested the links, you need to publish your page on the Internet. Generally, you can publish your web page on the server run by the same Internet service provider (ISP), company, college, or school system that you use to access the Internet. When you publish your page on a server, you copy your page to a computer that lets other people see it. Ask your systems administrator or ISP about publishing your web pages; you may need to pay a few more dollars a month to have a web publishing account". In other words, with your saved .html document and your folder full of supporting graphic images you can upload this page to any server. Follow the directions of that server to do this (each one is a little different) but basically you have most of the work done! To read more about this visit the Netscape Communicator Tutorial. Also, their web guide, New to the Net is very helpful. Lights, Camera, Action!Technology Integration Through Television Production -Created by Dianne P. Wells, Gifted and Talented Resource Teacher, this page introduces and gives excellent links on how to produce a "professional, research-based, live daily television broadcast in addition to producing pre-recorded research-based news magazine segments and public service announcements"
Another helpful place to find really great resources is the MPT Learning Works site on the MPT home page. 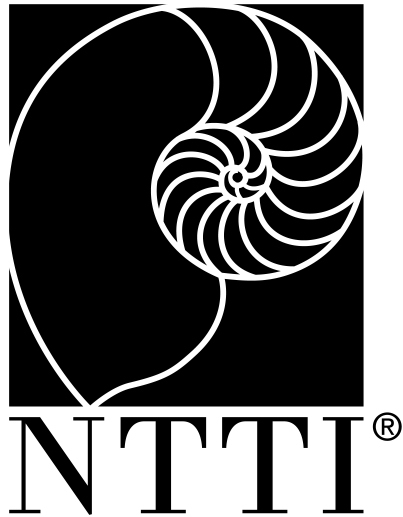 Cynde Mutryn and Sarah Blattner from MPT have also compiled an excellent collection of sites called Treasures of the Internet: A Sampling of Quality Sites and Resources that you might want to take a look at. Eduhound: Everything for Education K-12 - a really great source for lessons, sources, sites in just about ever curricular area! FREE web hosting with Angelfire ... i've used them for years, and even though they have that annoying pop-up window (which i click on to get rid of *right* away!) they are very easy to use and reliable when accessing. ikeepbookmarks.com - a really good site to store and access your bookmarks. feel free to email me if you have any questions/suggestions or links to share! thanks for stopping by!